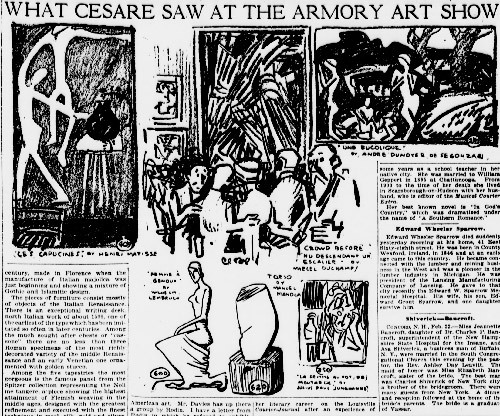 Walt Kuhn, one of the Armory Show’s chief organizers, recalled the great variety of visitors who came to the 1913 exhibition “to be refreshed by the excitement.” Contemporary critics agreed: according to The Independent, watching “the effect of the pictures on the crowd” in the Armory was more interesting than looking at the pictures. The New York Evening Post described the spectrum of reactions: “In half an hour’s visit to the Sixty-ninth Regiment Armory one may meet with ridicule, rage, helpless questioning, and savage enthusiasm, but not with indifference.”  The eldest son of financier J. P. Morgan stormed around the galleries protesting that it was a damned outrage to have to pay a quarter to see this stuff. Famed Italian tenor Enrico Caruso thrilled visitors by drawing caricatures of the paintings on view. “The Cube Root of Art,” The Independent 74: 3353 (March 6, 1913): 493. “International Art,” New York Evening Post, February 20, 1913, 9. Theodore Roosevelt, “A Layman’s Views of an Art Exhibition,” Outlook, March 29, 1913, 718. J. Nilsen Laurvik, “New Paths in Art,” The International 7, no. 4 (April 1913): 89. Carl Van Vechten, Peter Whiffle: His Life and Works (New York: Alfred A. Knopf, 1922), 123.